After the success of Crash Course, an educational YouTube channel that has covered chemistry, biology, US and World history so far; the Vlogbrothers, John and Hank Green are at it again. The pair recently announced the launch of Subbable, a crowdfunding site that has more in common with pledge drives and telethons than with KickStarter. 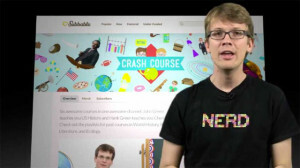 Crash Course was originally funded by Google in the hopes of creating self-sustaining shows, but as that seed money ran out the program found itself with a committed audience but not enough views to fund itself on advertising dollars alone. The solution? A good ole public broadcasting style fundraiser. The Greens argue that when content is driven by advertiser dollars it is made to garner the most views, leaving all other metrics, those of quality or educational effectiveness, to languish. The decline of the History and Learning channels was caused by just such a mechanism. But what if creators could care instead about drawing committed viewers willing to support a project they care about? Much like Wikipedia's yearly funding drive, Subbable asks fans of Crash Course to subscribe to the show for an optional monthly fee. They have even taken on public broadcasting's gift model, allowing subscribers to exchange points awarded them from dollars donated for swag like t-shirts and posters. As Hank said on Tumblr in July, it boils down to creating "a system that allows creators who value viewers over views to be successful." The effort was so successful in fact that the outpouring the Greens have already received managed to break the Amazon payment system Subbable uses to take donations. Crash Course is the first channel to use the Subbable system, though more are slowly being added. Hank Green says, "We ascribe to the idealistic notion that audiences don't pay for things because they have to but because they care about the stuff that they love and want it to continue to grow." And, because we humans have a pattern of simultaneous invention, another site, Patreon, also recently launched with much the same goals as Subbable. The difference being Patreon is a by-release tipping system, allowing you to give a creator a fixed amount of income for every video/song/video game they produce while Subbable is aimed at larger (and primarily educational) content supported through monthly subscriptions. Just as social media allows people to skip the middlemen of marketing departments and simply address their audiences directly, Subbable and Patreon, much like their predecessors in public television and radio are attempting to do the same. This transplantation of public broadcasting funding techniques allows these sites to appeal to an already familiar notion for many fans, the free-to-use but support-when-you-can model. It is interesting to watch the repetition of similar funding tactics across various technological platforms, and to see how each technology changes the idea of crowdfunding to suits its needs. For example, of the three -- radio, television and the internet -- only the internet eliminates the borders of geography, allowing these systems to raise money from viewers all over the world. This development is yet another mark of the growing popularity of video online and the further fragmentation of traditional content categories, putting the online public back in public media.